This tapestry 'Elephants' shows an elephant roaming the plains of Africa, with her young calf just behind her. The elephants of Africa are majestic creatures and are revered in African and Asian culture and life. Here, the vivid textures of the scene are superbly captured, including the roughness of the elephant’s skin, to the furriness of the grasses of the Savannah. 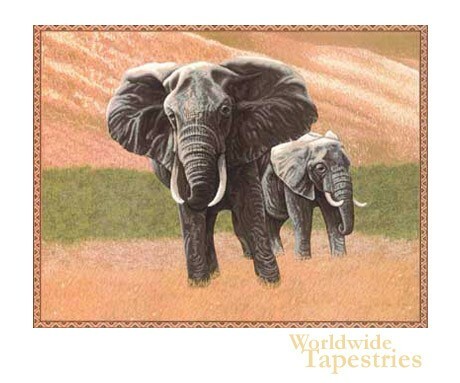 Finely woven and designed, this piece is a captivating study of the majestic elephant in its natural environment. This elephant tapestry is lined and has a tunnel for easy hanging. Dimensions: W 68" x H 52"